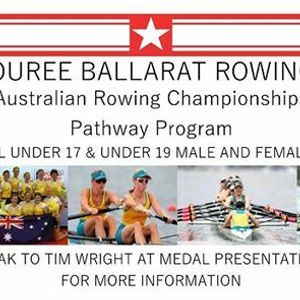 Wendouree Ballarat Rowing Club is recruiting under 17 and under 19 rowers and coxes to try for selection into the Wendouree Ballarat Pathway Program, and row at the Australian Rowing Championships. This program is targeted towards athletes and coxes who are not already representing their school at the national championships but have a desire to compete at the highest level possible. 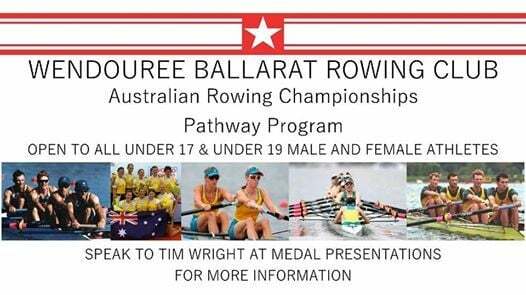 Wendouree Ballarat RC will send male and female crews to represent the club in both under 17 and under 19 events. Rowers in age brackets above U19 are welcome to also register their interest. Training will begin Monday 25th February for boys and girls. The club has purchased two brand new Sykes racing fours and lightweight oars to support the program. Any girls also competing at the Head of the Schoolgirls regatta are encouraged to register their interest. The training schedule will be accommodating to all. Wendouree Ballarat will manage all logistics of the trip and provide supervision while away. If you are interested and would like to know more please contact WBRC Head Coach, Paul Blanchfield.